Welcome again on my blog for day three and last day (boohoo it's so sad) of the Newton's Nook Design release. Today we share "Newton Scoots By". * Welkom terug op mijn blogje voor dag drie en ook meteen de laatste dag (boehoe dat is zo triest) van de Newton's Nook Desgin release. Vandaag tonen we je "Newton Scoots By"
Would you like to win the "Newton Scoots By" Stamp Set? This set will be given away to ONE lucky winner! Here's how to win: Comment on the NND blog and Design Team blogs (see list below)! The winner will be chosen at random from the collective reveal posts. Make sure to check out each of their blogs and comment for your chance to win. You will not know which blog has been chosen so the more you comment on the better your chances are of winning! You have until Thursday May 11th at 9pm CST to comment -- winners will be announced on the blog post on Friday, May 12th. * Wilt je de "Newton Scoots By" stempel set winnen? Deze set zal worden weggegeven aan ÉÉN gelukkige winnaar! Hier is hoe om te winnen: Schrijf berichtjes op de NND blog en de Design Team blogs (zie onderstaande lijst)! De winnaar wordt willekeurig gekozen uit het collectief van berichten. Zorg ervoor om op elke blog een commentaar te schrijven voor je kans om te winnen. Je zult niet weten welke blog gekozen is om de winnaar uit te zoeken; dus hoe meer je schrijft hoe beter je kansen! Je hebt tot en met donderdag 11 mei om 9 uur CST om bercihtjes te schrijven - de winnaars worden bekend gemaakt op de Newton's Nook blog post op vrijdag 12 mei. This is an awesome card, love it! Your card is just adorable. Love the scene. So creative with the balloons. Great design and fun with the mountain tops and balloons in the backdrop! Love how you did the sky and clouds. What a great scene you made on this card, love the little hot air balloons way up at the top. So cute. Oh, what a lovely card. I will take it as an exemple as it's perfect for one of my best girlfriend who loves riding her scooter. Such a cute and fun loving card. You did such a great job designing the card, and coloring the images. I love this stamp set, and hope I win it. Thank you for sharing your card. Och jee, deze stempels zijn ook alweer zo leuk! En jij maakt er ook de meest geweldige kaartjes mee, enig!! Love the card. The coloring is so pretty and just the design is awesome. Sooo pretty, like be the pink scooter!!! You created such a great scene with so many wonderful little details. Your coloring is amazing. 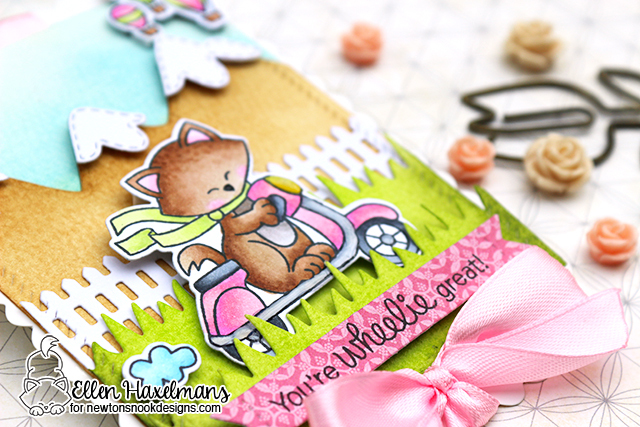 Love this wheelie great scene you created! Another gorgeous scene! I love the pretty colors you used on the this and the addition of the hot air balloons is so perfect! What a lovely card! Love the cute scene you created! Darling card! I love how he is scooting through the countryside with the mountains in the background...wonderful card. This is such a delightful scene! Love the snowcapped mountains and the hot air balloons in the background! CUTE! Love this adorable scene and all the extras you have into it! So creative, your background scene is stunning! You created such an adorable scene card with Newton on the scooter. I love all the little elements you used to create your card. Such a beautiful card, love all the layering! It's look like Newton is fully enjoying at hill station on his new scooter, so cute!